Era Vulgaris was a slightly disappointing but highly predictable misstep by Queens of the Stone Age. After all, how many bands retain consistent levels of quality when their most creative and influential members are slowly stripped away? Although Era Vulgaris showed glimpses of why The Queens are the kings of mainstream rock music, it yearned for the intensity of Dave Grohl behind the drum kit, and it suffered from the lack of vocal variety which Mark Lanegan previously brought - not to mention the contributions of the notorious Nick Oliveri. 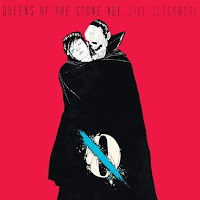 Seeing all of these familiar talents in one place again in one capacity or another was almost inevitably going to result in an excellent release, but ...Like Clockwork has managed to exceed even that expectation, and is comfortably the band’s finest release since 2002’s seminal Songs for the Deaf. If Era Vulgaris was an unrestrained dive-bomb into the queasy and perturbed and Lullabies to Paralyse was a voyage into the bleak and dark, then ...Like Clockwork is the band dipping their toes into both creative pools. Certainly their approach sees a conglomeration of previous styles, but the overwhelming sound is one of maturity that walks with all the swagger of John Travolta in Saturday Night Fever. The Queens confidently trade in breakneck riffs for bluesy hooks and brooding tones, and it’s a move which has resulted in some of their strongest and most memorable choruses to date – as well as a higher level of consistency than they've achieved for some time. Both “I Sat By The Ocean” and “If I Had A Tail” ooze song-writing prowess: the former benefits from a touch of the sinister harkening back to Lullabies to Paralyse, whilst the latter practically commands you to grab a beer and bask in the sun with its gregarious nature. The lead guitar lines lazily take the forefront on both the aforementioned tracks, and the tight rhythm sections provide toe-tapping grooves alongside Josh Homme’s trademark laid-back tone, which comfortably ranges between a typical deep delivery and near falsetto high notes. This approach is so wholesome, that only the up-tempo “My God is the Sun” breaks the mould. Determined dual guitar work and frenetic drumming are commanded by a penetrating bass-line in the album’s most urgent offering, which still manages to fit snugly in amongst the blasé formula in a way which previous high octane-offerings perhaps wouldn't. ...Like Clockwork is a brilliantly cohesive and rounded album which has benefited from the passing of years and the branching out of styles by the band’s members. The fleeting return of Grohl amongst other familiar faces has conjured images of carefree days jamming with your high school buddies again after years apart, and the smooth precision with which ...Like Clockwork is crafted makes it feel as though they've never been away.